Some of you may have experienced the unfortunate kernel panic on boot problem that is occurring on certain Macs after they’ve installed recent software updates. If you haven’t installed the “Thunderbolt Software Update 1.2” yet it’s best to avoid it completely until a fix comes from Apple. If it’s too late and you’re experiencing crashes on reboot, then you’ll probably want to know the cause of the kernel panics is that recent Thunderbolt Update and we’ve got three different ways to resolve the problem. Before beginning, there’s some good news and some bad news. The good news is each of these methods will maintain your files, preferences, apps, settings, and customizations. The bad news is that you’ll either have to reinstall OS X (just the operating system), or restore from a Time Machine backup. Regardless of which approach you take, do not install the Thunderbolt update again when the Mac reboots if it’s available in Software Update, wait until a fixed version comes from Apple within a day or two. This will redownload and reinstall OS X Lion from the internet, it’s fairly automated once you begin the recovery process. This is only going to be practical for those who make regular Time Machine backups, if you don’t, you should start doing so now. This method will require you to reinstall general system updates afterwards, because the version of OS X being installed is the same as what’s contained on the USB boot drive. This is probably the least practical approach as a result. Regardless of the approach you take, do not reinstall the Thunderbolt update. We’re repeating that because if you do reinstall it before it’s fixed by Apple, you will end up in the same kernel panic situation again and that’s no fun. These kind of problems are fairly rare but they can happen, which is why we recommend regularly backing up a Mac with Time Machine as one of the four essential maintenance tips for any Mac OS X machine. If you need further assistance, jump into the comments or join the lengthy forum thread on Apple Discussion Boards. Steve Jobs would be cursing out the team responsible for this debacle, in no uncertain terms. Glad I avoided that one for now. Phew. Well… wish I would have seen this before I tried the update last night. Ended up not being able to recover anything, and it was causing problems on my Windows partition (particularly with Ethernet no longer working). Ended up wiping and re-installing OS X. I still have not done this particular update even after re-installing everything. Well I have a macbook pro and a hackintosh. Or You could just boot into recovery, open up terminal and delete /System/Library/Extensions/IONetworkingFamily.kext/Contents/PlugIns/AppleBCM5701Ethernet.kext on the Lion boot volume – granted affected models will lose ethernet networking – but You can extract and restore the file from 10.7.4 combo package. And repair permissions using disk utility. That sounds great, can you confirm this works? This happened to me and cost me $100 to fix…… It happened before all these helpful tips. Yes, it bricked my 15″ MBP i7 2.3 ghz. And Apple plans to do automatic updates even when machines are asleep? I just replaced the HD with a WD 1TB and recovered from the latest tm backup. Not a happy camper last night though…. Apple can do better. I just reinstalled osx lion a few days ago, it’s really annoying. Is there a way to avoid the thunderbolt upgrade until the reboot ? Me too, so I have just left it sleeping. Just incase! Anyone know if you can undo an update? @Alex Hutnik: Thanks Alex. I followed your procedure and it fixed my system. Thank you very much. Took mine into the Genius Bar this morning (2011 Macbook pro 13″). There were about 100 people there with the same problem. 30 minute fix. Really worth just doing that. I lost nothing and am completely back in business. solution #1 – didn’t do the magic. solution #3 – executing it and in progress…. Note: This is only a workaround for thunderbolt driver problem. 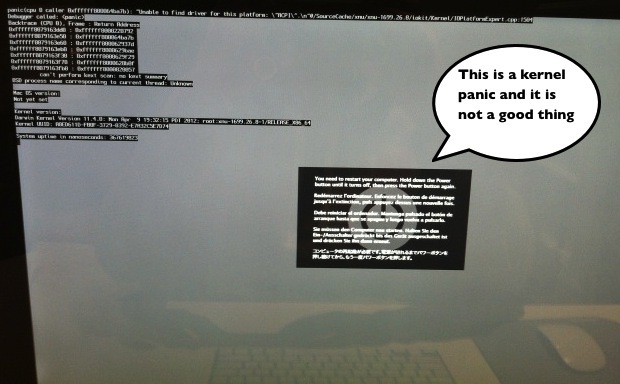 If you download and update “it” again, you’ll get your kernel panic again. “it” – thunderbold update driver. I had the same problem after software update. I reinstalled OSX from internet(solution 1) after pressing command+r during boot. Its a 3 hour process but finally worked. I have all my data safe. Same problem here. I used fix#2 – restore from my Time Capsule. So far so good. The trouble started when I after the recover should start to make backups to my time capsule again. The backup process stopped or slowed down to a speed that would take months to backup my 360Gb. I think I’ve tried the most – restarting the TC, deleted the TC…. (for the timebeeing I have no backup) – but the same thing happen. After backing up 62,47Gb, it “stops” (slows down to a speed of “zero”). Can anybody help? So…. Did that update to fix the problem ever get published? ?